St Jerome (about AD 340 – 420) was one of the four Latin Church Fathers… [In Caravaggio’s painting] St Jerome reads the Bible and is poised to write: this is the image of Jerome the scholarly Bible translator… The emphasis here is asceticism, the transience of life on earth, and ever-present death. Jerome’s domed head is echoed by the skull… This is a memento mori: human beings die, but the word of God lives on. …The dazzling light in which Caravaggio clothed St. Jerome, the light of divine inspiration. We do not know exactly how Caravaggio became a Knight of Malta, but the circumstances suggest that Fra Ippolito Malaspina, Prior of Naples, has a good deal to do with it… His head may have been the model for St. Jerome. The light streams off the bald head of the Saint… His arm stretches out as if to dip his quill. It is probable that the painting shows Saint Jerome absorbed in his translation of the Bible from Hebrew into Latin, the deed he was promoted and beautified for. The Holy books opened on the table, symbolically separate St. Jerome from the skull that, as if, is biting the holy text. What is suggested here, it seems, is the motif of antagonism between spiritual wisdom as life and unredeemed death as a spiritual failure. St. Jerome‘s red cloak is echoed by the white mantle hanging on the opposite side of the table that in combination with the skull completes the allegoric image of death opposing St. Jerome’s intellectual vigil. What is metaphorized by the opposition of St. Jerome as life in the human flesh and the skull/white mantle figure with wooden leg “borrowed from the desk”? The skull/mantle represents, it seems, the death of a geographical man as a dominant historical type, the human being who uses his legs (his own or his horse’s) or sails to move across geographical space, and the birth of a spiritual scholar, a person who instead of crossing physical distances covers the cultural horizons of human life. This spiritually oriented scholarly man is not a follower of the space but its unifier. Spiritual intellectual moves from holy books of different nations and regions to that of other cultural locations, by transferring/translating human wisdom of various cultures. The spiritual scholar moves through the human world via the mental concentration which Caravaggio admires in St. Jerome. People like St Jerome stretch arms to embrace other people‘s spiritual yearnings, not just “stretching legs” in order to meet people. The hands/arms of the Saint are stretched to other scholars not only over the semantic maps of written pages, as we see in the painting, but over the continents, as before only legs of pilgrims, travelers, merchants and warriors could. The intensity of St. Jerome’s intellectual concentration is contrasted with (and supported) by his not less intense bodylines. Caravaggio, as if, suggests here that there is no contradiction between spirituality and body if a person is dedicated to spiritual life. St. Jerome’s arms and torso are ascetically athletic. His body is sublimely strong. The physical stretch outward of St. Jerome’s hand-arm through the “landscapes of books” makes his arm look almost of the leg’s size. The stretched right arm-hand and the left hand holding the margin of the page are combined in a metaphorically equivalent way with the human legs in a process of walking – one arm is stretched while the other is, as if, prepared to. But why St. Jerome’s gaze is not directed at the page of the book? Why is St. Jerome looking, rather at the book’s margin, book’s side? Here we ought to praise the intuition of an extraordinary painter that found a unique visual accent, in order to emphasize the fact that St. Jerome is a translator, not just a writer. He is concentrating on what the text he is reading means and on how to deliver its meaning through new words belonging to another language. St. Jerome as a translator of the holy texts is in his own assessment a very modest man. 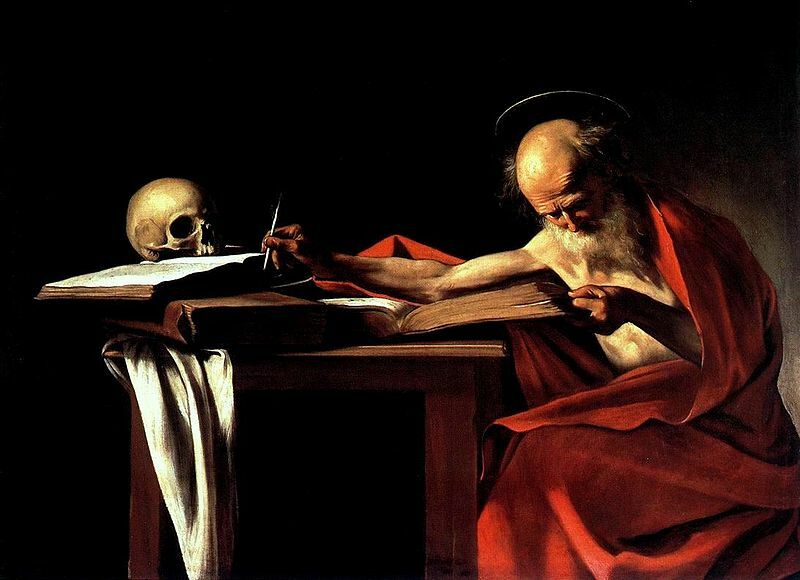 Caravaggio emphasizes that with his humility St. Jerome thinks that he belongs to the edges of the holy texts. He is first of all a reader and an interpreter, not a creator of holy texts. That’s how psychologically exact detail appearing contrary to our expectations expresses the particularity of the character depicted. If holy wisdom belongs to god, and then the creators of the sacred texts are god-inspired, St. Jerome feels reverie towards the very letters and words, which express god’s inspiration. His task is to deliver the language of holy wisdom to people of earth. He looks at the book’s side-edge but he also sees his own fingers that are keeping the edges of the pages with all power of his dedication. A less semantically sensitive artist than Caravaggio, could represent St. Jerome as looking right at the center of the page, not to its sideline and not noticing his own fingers attached to the very linguistic matter of the spirit, to the physicality of the Godly Book. For a mediocre or an ordinary painter literal truth always gets ahead of the semantic one. But Caravaggio’s painterly accents are very often paradoxical and always override the obvious.